It feels like I have always been interested in food and cooking. One of my earliest memories is being in the kitchen with my grandmother. Grandma Tini loved to bake, and when she did, the kitchen was filled with the aromas of cinnamon and vanilla. When she took a beautiful cake out of the oven, her face broke into a smile, and she placed it on the table like a gift she was giving to the family. Later, when I had kids of my own, I enjoyed cooking for the family. I got involved in school events and learned how to cook for large numbers of people. Sometimes friends would say “you should go into the catering business”, and that’s how Delicious Catering was born. First with my neighbor, Paula, and then with my good friend June Buckner, the company grew. June and I knew we needed a kitchen of our own, so we went to the bank and got a loan. That was 1983. I started working with food at Church functions. As the minister‘s daughter, we were there from the beginning to the end of the events, and I was always drawn into the kitchen. The array of food was always amazing. This love of food led me into restaurant work. I started at Sizzler in Corte Madera, where I was in charge of the counter. It was not a cooking job, so when an opportunity opened up for a cooking position to help open the brand new Good Earth in Larkspur, I jumped at the opportunity. While I was working there, I attended and graduated from the Hotel and Management program at SF City College. Fate intervened when I ran into Annie Buckner, daughter of June Buckner, who had been an employee of mine at Sizzler. She let me know that her mother owned a catering company, so I gave her a call. I was hired to serve at an event, and I had to return a piece of equipment, and the next thing I knew I was the kitchen manager. Delicious Catering is based on the values Jan and Teresa share. Using the best and freshest ingredients, their goal is to let the flavors and colors of the food speak for themselves. While they follow the food trends, their first priority is to use seasonal products at the peak of their flavors. Catering is much more than food. While planning an enticing menu, they also plan the overall logistics of the event, including the layout and timing. They listen to your vision, and then bring it to reality. As the business has grown, so have the kinds of events they cater. Delicious can now provide a served meal for 400 people, a fundraiser for 500, but will still cater the office party for 35. Part of the success of Delicious is the sense of family among the employees. There are also some real family ties, since Jan’s daughter Lara has been an event planner with Delicious since 1999 and Teresa’s daughter Allison has worked for the company since 2000. There is often a family feeling developed with customers. Over the years we have catered someone’s wedding, then an event to celebrate the birth of a child, that child’s Bar Mitzvah or Confirmation, and then the wedding of that next generation. They also have provided food for memorials, as that is a part of life too. Jan Goldberg was born in Los Angeles, and moved to the Bay Area when she started school at UC Berkeley. She graduated with a degree in Biochemistry. She founded Delicious Catering in 1975. She loves early music, such as Bach and Vivaldi, and is a Giants fan. Little known fact: when stressed, Jan appreciates a small ramekin of chocolate chips. 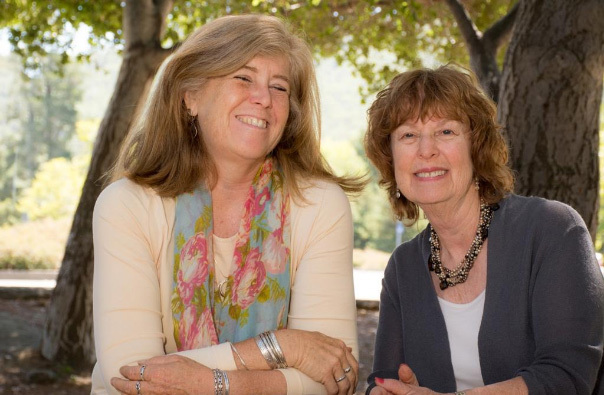 Teresa Hammond grew up in Mill Valley and graduated from Tamalpais High School. She graduated from the Hotel and Restaurant Program at SF City College. She joined Delicious in 1983. She enjoys church activities, and loves the slot machines when she goes to the casino with her Mom. She has the best collection of scarves and silver jewelry anywhere! Imagine 1982 - I just started working at A Party Center, knowing almost nothing about the industry. In walks Jan Goldberg from Delicious Catering. She was kind, considerate, professional, and willing to teach a newbie. Things haven't changed. She and Teresa are a class act - delicious food, professional staff, and innovative ideas!